If you are a prepper like me, then you know the importance of having a good generator. I've spent a lot of time trying to locate a good generator that will stand up to tough environments, provide you with a good amount of power, be efficient with respect to its fuel, and deliver good value for the money. Today I'm reviewing a pair of portable generators that are worth your consideration. I'm looking at two different brands so we can compare Generac vs Kohler and decide if either one would fit your needs. These are unstable times in geopolitics, so now is the time to invest in finishing your preparations. A portable generator needs to be easy to transport or it has failed at its basic mission. You must fuel it with gas or some other type of fuel, or charge it up with an outlet: you will see examples of both today. It is important to keep the role of the portable generator in mind. On the one hand, they are perfect for camping trips and other times when you have a short, pre-defined time where you need power. The other main use for a portable generator is as backup power. In today's uncertain times, it is more important than ever to be prepared for anything that might happen. A portable generator can be a stopgap energy source while you find a permanent solution if something goes wrong with the power grid. It cannot and will not function as a true backup on its own. A portable is just too small and does not have the output or capacity to give you sustained power. It is an emergency backup in the sense that it can get you through a loss of power for a few hours, but not much more. The ideal buyer for this is someone who already has a full backup generator and wants a portable solution. It's critical to get that full backup generator so that you know you will be safe if the grid goes down. I will review one product from each of two companies that I think do good work: Generac and Kohler. The Generac generator is somewhat cheaper, while the Kohler is easier to transport. In general, these are typical examples of portable generators. They both have the ability to power a wide range of electronic devices and appliances. However, they both do this in different ways because the Generac is powered by gas and the Kohler is powered by an internal battery that requires charging. Each of these generators can provide you with hours of energy for anything you connect to them, but the more energy you use, the shorter they will last. Can't keep it inside & will require covering when outside. A bit more maintenance than needed. The Generac portable generator has a list price of $799. It uses gas to generate electricity and also requires oil to make sure that the generator is functioning properly. If you are planning to use the Generac for survival or as a backup, this is a double-edged sword. On the one hand, the fact that the generator runs on gas means you do not depend on having the electrical grid be up and running for the generator to work. In a survival situation, you will need a source of power that doesn't rely on having the nation's infrastructure work properly. For example, a nuclear strike that included an EMP blast would totally eliminate the grid. Having a gas-powered backup would be the perfect solution, as long as you have sufficient stores of gas. I always recommend storing some fuel supplies in a secure location. On the other hand, you are limited by the amount of gas that is available to you, and to a lesser extent, the same goes for oil. If you do not have a significant amount of gas saved, then the generator will not be able to run for very long. Even then, the Generac is still a small, portable generator that cannot function as the main power source for a traditional home. What's more, if you do have a large backup generator, then it is likely to run on gas as well. That means you will have two generators competing for the same resource, which can be complicated. Turbo uses more gas and is louder, but it has a higher power output. Economy is just the opposite. Please note that in all cases, this generator emits potentially dangerous fumes. That means you cannot use it indoors, because you risk suffocating yourself. The unit as a whole weighs less than 50 pounds, but it is bulky and awkward to carry. The main question that you need to ask yourself is whether you already have a backup generator that you trust and a stockpile of gas. This is a solid, reliable generator,but it isn't meant to run appliances for daily use or other similar jobs. Where it shines is in its independence from the grid, its portability for field work, and its reliability. Most preppers could benefit from a portable generator, but that doesn't make it a necessity. Think carefully about the gear you have already and whether this is a good use of your money. If you do decide that you want a portable generator, the iQ2000 might be a good choice. The price is reasonable for the quality of the unit, and it has enough durability to go the distance. You do need to just be aware of the limitations of how these units work. You can't bring them inside, so if they become necessary during a storm you will need to go outside to set them up. 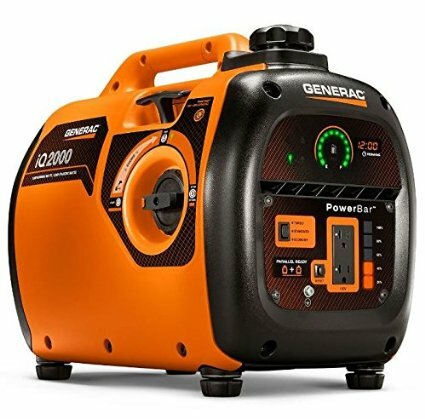 That said, there are many situations, especially out in rural areas, where a portable generator like the Generac iQ2000 is exactly what you need. Summary: This would be a fantastic generator for the average citizen, but if you're truly buying this for a shtf scenario you're cornering yourself in a big way. If there's an EMP attack you'll be without power and options for electricity. ,800 W Indoor Outdoor Battery Powered Portable Inverter GeneratorThe Kohler Encube1 presents a very different type of portable generator. Like the Generac iQ2000, it has an inverter that lets it safely power everything from a fridge to a smartphone. Where things differ, though, is in the source of power generation. Technically, the Encube1 is not a generator at all: it is a battery. The Encube1 draws power either from a standard 120V outlet or through solar panels, which are not included with the unit. That is a very different approach from a gas generator.If you do not use the solar panels, then you need to charge up the unit by plugging it into the wall. That obviously requires the presence of a working electrical grid. No grid means no power, so you won't have any way to charge the battery. You can also charge it if you have a big backup of your own that is powering your house, but that might not be the best use of that power. In other words, without a solar panel, this machine will not function particularly well to provide power for you in a survival situation. The best it can manage is a camping trip.On the other hand, if you have a solar panel or panels that will provide you with the raw energy you need to charge the battery, things are very different. Solar panels give you renewable energy that does not depend on the grid at all: it is all made in your property. Not only will that allow you to escape your dependence on the grid, but it also means you need not store up gas. That itself is a problem, because there is only a limited amount of gas available. If you run out, you simply won't be able to use your generator anymore. The fact that solar is renewable should mean you are already interested in it. However, all this convenience comes at a cost. The Kohler costs $990, about two hundred more than the Generac. That is a major increase in price, and the solar panels are even more on top of that. If you go the other route and just draw power from the grid, then you will need to pay for that in your electric bill. For all of its potential advantages, the battery style of portable generator is significantly more expensive. That means you need to make some choices about how you want to spend your money. When all of this adds up, it might not be the case that a portable generator is the most important investment for you, especially if you lack a proper backup generator. On the other hand, if you already have solar panels, then this generator becomes a lot more appealing.There is plenty more to consider. The Kohler has wheels and a handle for easy transport, and it also weighs twice as much, so it is harder to carry around. In addition, because it is a battery and not a generator, the Kohler has a special feature. You can run it indoors, and it is also very quiet. 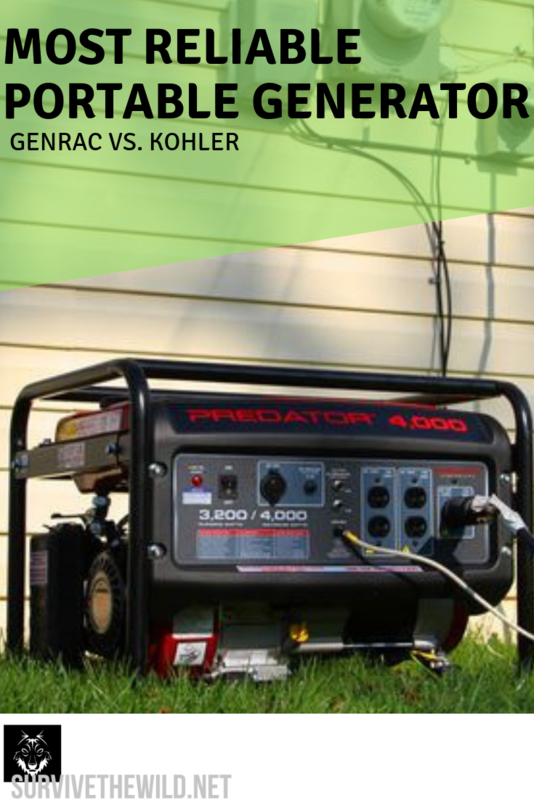 These two facts make it a better machine for general utility than the Generac, although again the price difference is significant.I encourage you to weigh these two generators carefully. They offer very different sets of features and the cost of buying either of them is fairly high, so you should know what you want before you commit. That said, I do think a portable generator is a good thing to have around for preppers. I would not say that it is a top priority, but you should have one eventually. The Generac vs Kohler question is just a matter of finding out what matters more to you. You don't have to just take my word for it. I looked online and these two generators are pretty popular, especially the Generac. It's one of the top selling generators on Amazon, all while maintaining a good average score. The Kohler is less well-known but customers still like it. In case you want some more options, I have looked up some alternative generators for you. These will show the range of what is available and help you settle on a final choice. 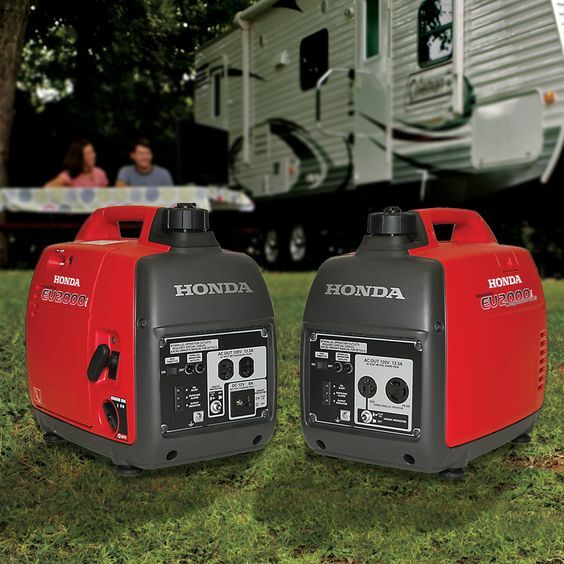 Honda's gas generator is compact, but powerful. It can run in parallel with two other units for even more power. However, it has no other standout features, and it is quite expensive at $1099. At that point, you are paying for the Honda name and reputation, not the quality of the generator. 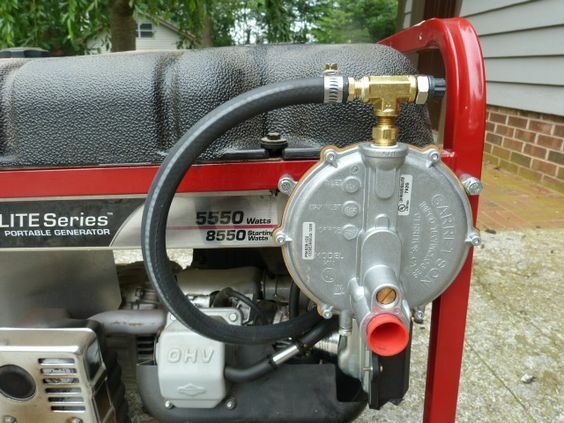 Briggs and Stratton offer this excellently-designed gas generator for $1299. I think it works really well for home use and camping. I have two problems with it, though. One: it is far too expensive. The models I reviewed in detail are just as good and with much lower prices. I am also skeptical that this could be effective in a survival scenario-- it seems to be more geared towards hobbyists in the woods, rather than preppers. I don't recommend spending the money on this unless you want it for camping. Anker gives us this inexpensive battery generator. Like the Kohler, this unit uses solar panels or an outlet to charge up. It has a useful array of outlets on the generator, including a USB port for smartphones. At just $599, it's a steal. However, I am concerned that it is not durable: the warranty is only 18 months, so I wouldn't trust anything big to this machine. It also doesn't have as much capacity as the Kohler. Well, I hope you have learned more about portable generators. I pitted Generac vs Kohler because I think they are well-rounded and valuable products, but you know your needs better than me. Read through my guide and you'll be able to tell if a portable generator is right for you, as well as which one you might want. This is a serious purchase, so give it the attention it deserves. I don't think there is any one best option because it depends on what you need and what you want. Pocket Power Plus: A Truly Reliable Portable Power Source? Chief editor here at Survive The Wild, I'm a proud husband and father passionate about survival and preparedness that doesn't involve dependence on anyone but myself! Click here to see all the options of awesome shirts to represent your superior prepping! How to Preserve Meat with Salt without Putting It in the Fridge?